SHANE PRIGMORE: I WON SOMETHING ?!!! Congratulations, Man! You practically deserved it! Congratulations, Shane. I am so excited for you. I can't wait to see what you do next. Congradulations! Throughly well deserved. Your Coraline designs were amazing! I had my money on you! Well deserved!! Conratulations. I wholeheartedly agree with the award's choice. Congrats! Congratulations, once again, Shane. 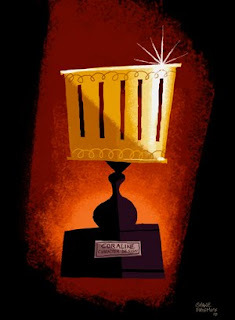 You really deserved it, the designs for Coraline were simply brilliant. Hooray!!! I'm so happy you won, I LOVED the designs in Coraline. THANK YOU SO MUCH EVERYONE! The best part of this whole thing is just hearing from my peers and talking with old friends. It means alot guys. Your excitement made me laugh out loud- to see such enthusiasm from someone who's been in the game as long as you have. Congratulations! The accolades are certainly deserved! We look forward to cheering for you in the future! congrats!! you deserve it big time! glad to hear the great news. Awesome Shane! Those were great designs congratulations. Congratulations Shane! You've inspired all of us either directly or indirectly! Congrats! Keep up the awesome work. SHANE!!!!!!! That is fantastic! Congradulations! You deserved this. I have to tell you that I saw the movie shortly after Angus died and I cried a bit, no.... I cried a lot! But at the end where he was healthy and running around again, it made me smile. I miss him. I can't tell you how fun it was to see him up there at the end chasing the bat around. Some day I need to get a picture of your Angus. Again, Good for you! Im proud of you Shane! I was in the front row and cheering!! Congrats dude, your work was/IS amazing! Well done Shane! Congratulations, this is so well deserved, absolutely brilliant work. Well done Shane-you deserved it. I'm little late about this but a huge congratulation about this, it's more than deserved. Let me at my congrats - Congratulations Mr.Prigmore - a well deserved award. AHHHHHH! Thats so awesome! Well done! Many Congrats! I want to work my but odd just to have a shot to work with artists as talented as you. Thanks for your work on Coraline it's certainly inspired me to work harder and my daughter and I enjoyed the film, as well. Way to go sir. I agree with the others that this is the first of many awards to come your way!!! Wow congrats! That's awesome and very well deserved! Congratulations! That award belonged to you and your beautiful work. CONGRATS! much deserved. i look forward to seeing more of your work. Shane! Congrats on the award and your blog and work is amazing man! Hope you are well. All the best. Congrats, great work. Can't seem to find your email address. Just wondering if you could email me at info@qubekonstrukt.com would appreciate it. i look up to you so much..